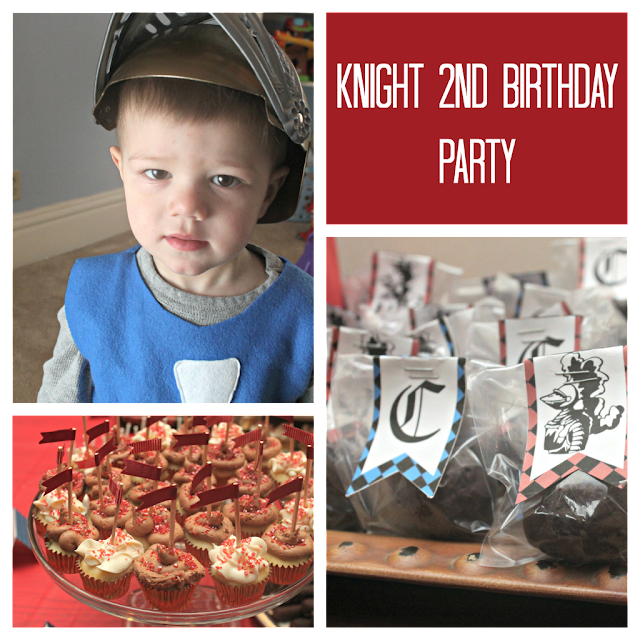 To celebrate his big day, we threw him a knight-themed party! I actually started planning his birthday in August because I didn't want to be caught by surprise and attempt to plan it all in a week this year (not that I do that often or anything ;) It paid off though, I didn't feel like I wanted to tear my hair out too much this past week. As usual, I made all of the paper printables for this party. Between the banners, invites and toppers, I went through 2 new cartridges of blue and yellow ink (much to my husband's dismay.) I just have way too much fun tailoring everything to the exact theme of each party. 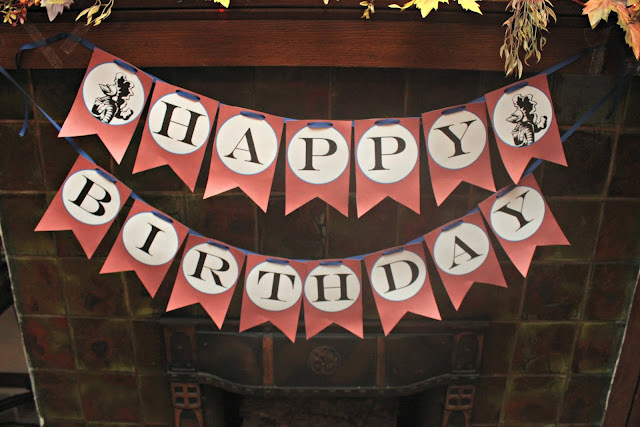 Like this birthday banner for example. It was pretty simple to design in Photoshop (the knights were made using clipart). A few punched holes and some ribbon, and ta-dah, the perfect knight banner! I'm sure I'll be using it again for future birthdays. I covered the pretzel rods in chocolate and added blue sprinkles to mirror the theme. 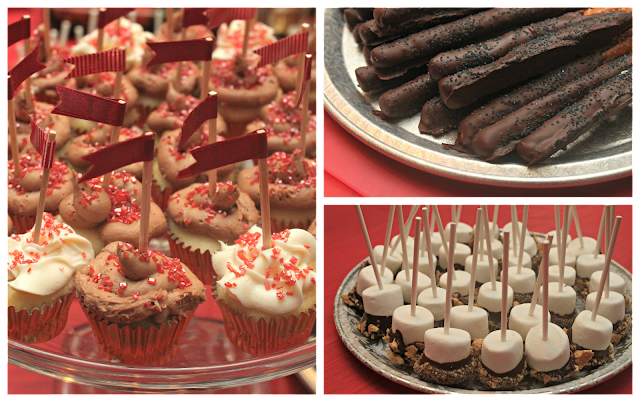 We also covered marshmallows in chocolate and dipped them into crushed graham crackers to make s'more pops. And of course, you can't have a party without cake. 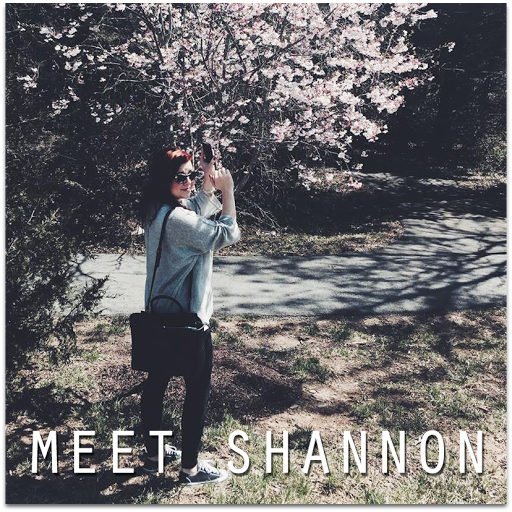 Shannon always makes the best cupcakes! She made mini cupcakes with 2 kinds of frosting: Nutella and cream cheese. 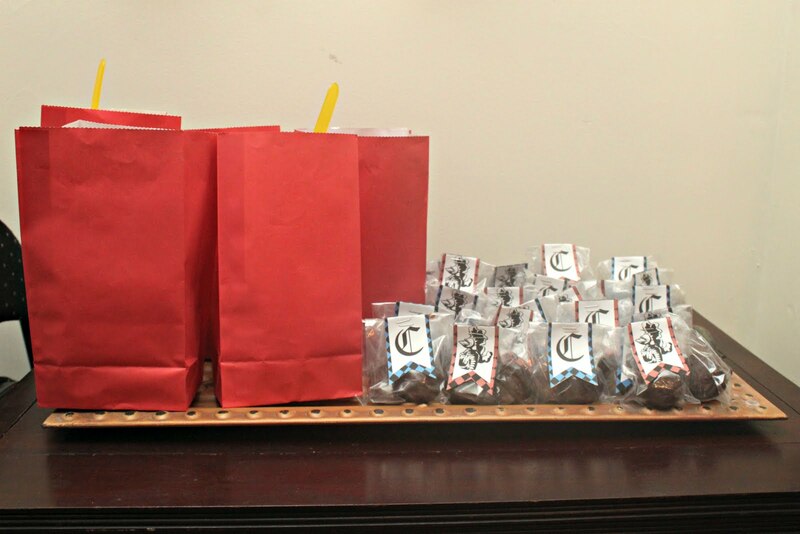 In addition to cousins, I allowed my daughter to invite a few of her friends over for the party and had favor bags for everyone. For the adults, they got homemade Oreo truffles (cream cheese + double stuffed Golden Oreos covered in chocolate). These were placed in little baggies and stapled together with tags that I made with knights and initials on them. 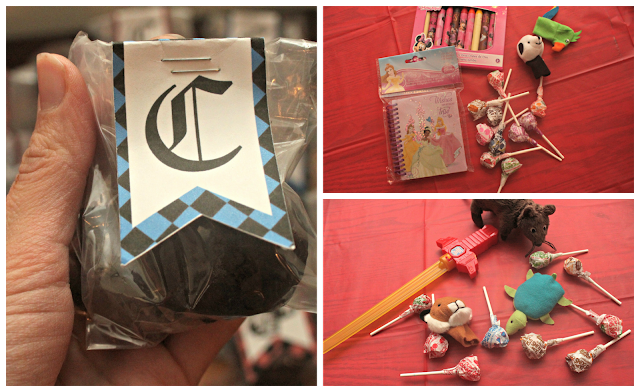 The kids each got bags full of toys, swords and candy. 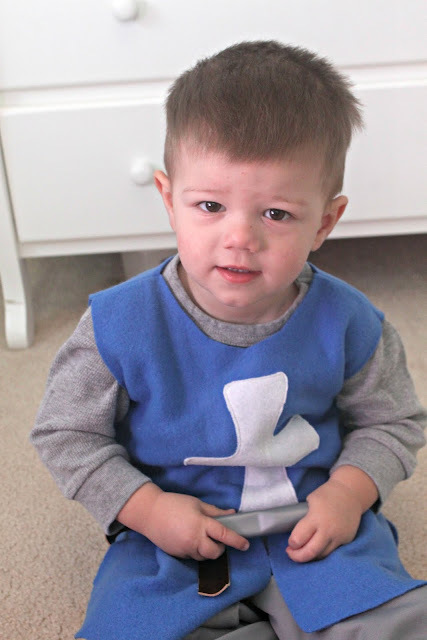 And of course I had to make a knight's tunic for the birthday boy! It was actually a surprisingly simple project (I'll be sharing the DIY later this week.) I thought he'd hate it and refuse to wear it since he's a typical 2-year-old, but once I put it on him, he wouldn't take it off and actually cried when I made him take it off for his nap. It made me really happy to know know that he really liked something I made for him. Getting pictures of him in the tunic was another story though. Happy 2nd birthday to my baby boy! I'll be sharing more projects related to the party later this week. 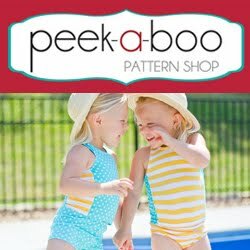 This is adorable and such a cute idea for a birthday theme! Happy birthday to your little guy! 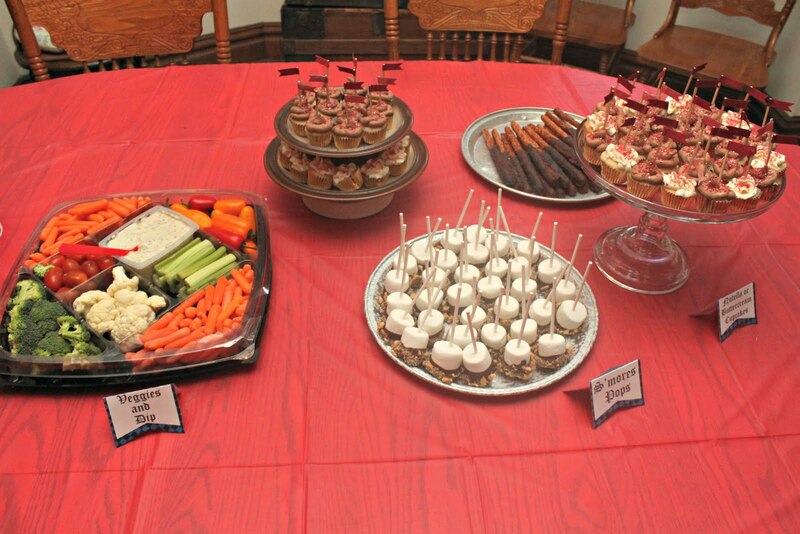 What a great theme for a party! It looks like everything turned out great. Happy birthday to your knight in shining armor :).